Local Pond Landscaping Company FREE Quote ➨ Install/Build Water Features Clean Backyard Fish Pond Koi Repair Liner Replacement Pumps Lights Cost. I Need Find Best Local Landscaping Company Install/Build Ponds & Water Features Clean Backyard Fish Pond Koi Repair Liner Replacement Pumps Lights Cost pond built with a soothing waterfall and stream, beautiful plants, fish and Koi we can custom create Water features are often included in landscape designs because. 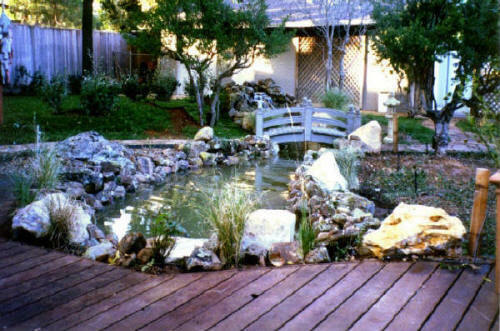 Water features divide themselves into decorative projects or water gardens. The distinction is that a water garden contains life, while a decorative feature (including most waterfalls) does not. This choice is your first major decision and needs to be made before you start considering how to build your water feature. Each type has its own characteristics that must be considered: Water features are often included in landscape designs because of the unique sights and sounds that they bring to both exterior and interior living spaces. Many people find a moment of peace as they listen to water splashing in a fountain and gurgling over rocks as it runs down to a waiting pond. Waterfalls Great for relaxing. Example #1: Q: "Can I put that neat looking nozzle in my fish pond?" A: A fine droplet spray nozzle would be fine in a decorative fountain, but in a water garden it will: 1. Plug with fish waste; 2. Increase evaporation, leading to greater concentration of dissolved solids and potential nitrate toxicity; 3. Disrupt the growth and blooming of aquatic plants. Example #2: Q: "Can I throw a few goldfish in the fountain for the kids?" A: Well, this means: 1. You can't use bleach or algaecide anymore; 2. Your pump intake screen won't cut it as a filter; 3. Your fountain may be small, above grade or too shallow to let the fish winter or endure summer heat; 4. The site may suffer from storm runoff, inadequate sunlight for plants, or ease of doing things like cleaning and partial drain/fills. After selecting the type of project, consider the site location, and construction materials. A pool under a tree may seem picturesque, but will fill with leaves during the fall, and if built out of flexible liner may get punctured by roots. Your pond should have a raised edge to avoid storm runoff that can run into the pool. This is very important with water gardens where the fish can be killed by insecticides or other chemicals. Winterization should be planned for in advance of freezing conditions. Your site will need a source of electricity for its pump. Submersible equipment must have Ground Fault Circuit Interruption (GFCI) protection, as well as have its other aspects of installation conform to Article 680 of the National Electric Code. Water features are often included in landscape designs because of the unique sights and sounds that they bring to both exterior and interior living spaces. Many people find a moment of peace as they listen to water splashing in a fountain and gurgling over rocks as it runs down to a waiting pond. The use of ponds, aquatic plants, fish and water features in landscapes is sometimes called water gardening. There is a wealth of information available about water gardens, ponds and waterfalls because aquatic gardens have been used in landscapes for thousands of years. From ancient Egypt to the neighbor next door, people have been enjoying the musical sounds of waterfalls and the slow but deliberate movement of fish in ponds since the beginning of civilization. If you want a pond built with a soothing waterfall and stream, beautiful plants, fish and Koi we can custom create this for less than you think. Our water gardens, ponds and other water features are custom designed to interact with our clients architectural settings. The beauty of stones and the sound of water flowing will create an atmosphere of healing for any environment..... Providing Services in:- Design and Install - Ponds - Koi Pond Builders - Pond Installers We create fish ponds, garden ponds, vanishing waterfalls, babbling brooks, and meandering streams that produce the wonder of natural sites and sounds and increase property values. Replaced my pond liner and pump. Providing Services in: Design and Install fish ponds, garden ponds, vanishing waterfalls, babbling brooks, Local/Near Me Ponds Builders (Amazing Prices) All Day Long! WE DO PONDS We create fish ponds, garden ponds, vanishing waterfalls, babbling brooks. 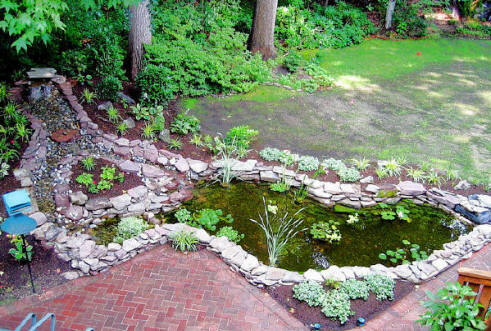 I Need Find Best Local Landscaping Company Install/Build Ponds & Water Features Clean Backyard Fish Pond Koi Repair Liner Replacement Pumps Lights Cost Free Quote pond built with a soothing waterfall and stream, beautiful plants, fish and Koi we can custom create Water features are often included in landscape designs because.